Orphan elephants bathe in the river at Pinnewala, Sri Lanka. 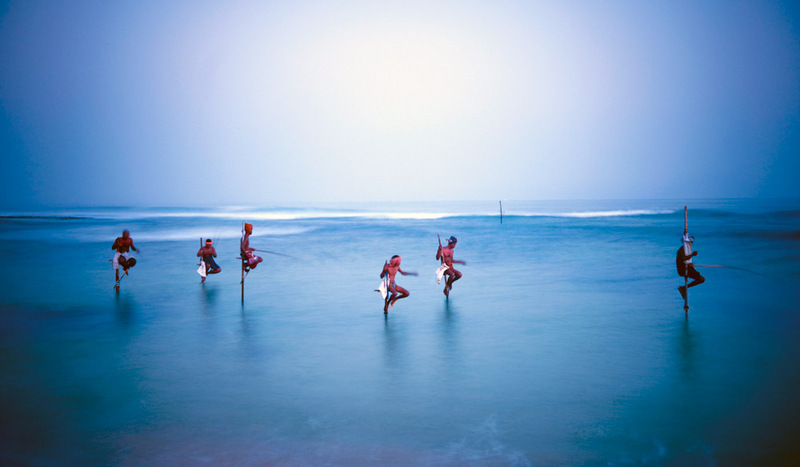 Traditional Stilt Fishermen showing off their skills, Sri Lanka. 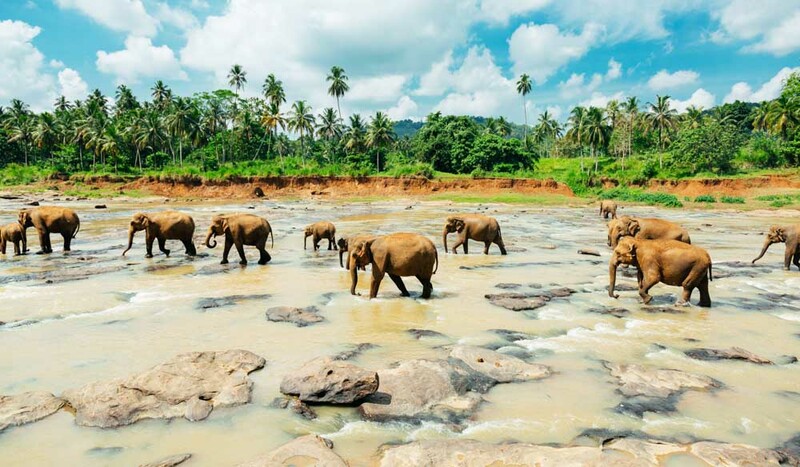 Venture through ancient civilisation and rolling tea plantations to Sri Lanka, a small but potent piece of Asia. Sri Lanka takes exoticism and beauty to extremes, packing a real punch in a small package for visitors. Nature is on brilliant display at Yala National Park, a massive nature reserve in the country’s south-east that is home not only to leopards, crocodiles, elephants, jackals and peacocks; but also remnants of ancient civilisations, evident in various stone temples. 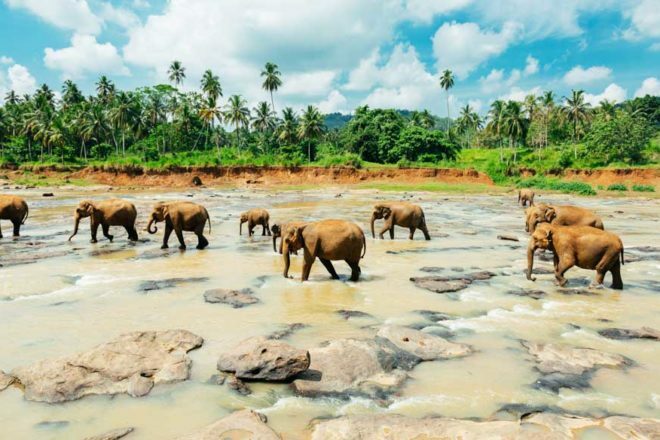 And at Pinnewala Elephant Orphanage, north-east of Colombo, you can watch the elephants as they bathe in the river and enjoy mealtimes. Another ancient civilisation lies in wait at the astounding Sigiriya Rock Fortress in central Sri Lanka. Here, on the slopes and summit of a dramatic 180-metre-tall granite peak, a sprawling capital was built by King Kassapa I in the 5th century; today you can marvel at the surviving frescoes, the remains of an enormous stone lion, and landscaped gardens. Sri Lanka is famed for its tea, and Nuwara Eliya – also known as ‘The Little England’ of Sri Lanka – attracted some of the first British tea pioneers, who revelled in the cool, mist-veiled climate. A visit here yields fascinating insights into both colonial history and Sri Lankan culture; with gorgeous old colonial buildings and golf courses intermixed with local village life; and rolling tea plantations – taste it at the source by visiting a local tea factory. Finally, Galle is the perfect place to soak up the seaside vibes of a bustling port city. Here, sultry tropical sights, smells and sounds mingle with grand old buildings and structures like the Old Town and Fort, hailed by UNESCO as the best example of a fortified city built by Europeans in south-east Asia.